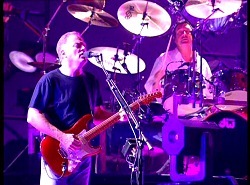 The 2DVD release of one of Pink Floyd's stunning 1994 concerts at London's Earls Court has been a long time coming. PULSE hits the stores in most countries at the start of next week, and is sure to be a big seller. Constant delays have fuelled the bootleggers market for the release, with sites such as eBay rife with copies of the original VHS and laserdisc versions, converted to DVD format with varying degrees of success. 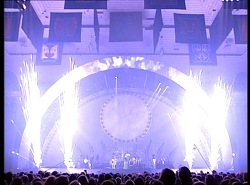 We know that a lot of work was done to try and render an acceptable widescreen (16:9 format) picture, bearing in mind the new breed of high quality, large widescreen displays, but as the concert itself was shot in 'fullscreen' format (4:3, or standard TV screen shape), this would have meant compromise with the finished product: a cropping of the top and bottom of the picture. As with anything, first impressions matter. Upon picking up the packaging, one cannot fail to be impressed with the subtle quality and sense used in the presentation. A digipack with a new cover shot, and a pocket inside backed with a live shot - coupled with a single tray holding both discs. If anything this holds the discs too snugly. I had concerns that the disc could snap or crack whilst trying to wrestle it out. Maybe there's a knack to it. In the pocket, there's a nicely done eight-page booklet, fronted by the alternate "eyes" shot from the forest that some of you will be familiar with. Inside are the DVD/concert credits, plenty of small live shots, and, sensibly, a map showing you how to get to the many extra features on the two discs. Popping the discs into the player further shows the effort of designers Storm Thorgerson and Peter Curzon, who have also done all the menu work. Lots of moving elements, and symbolic images - a very polished look and feel at all stages of the navigation process. One of the decisions you need to make early on, concerns the sound quality. This is the first disc we've come across with two Dolby Digital 5.1 audio streams - a 448kbps stream, and a 640kbps stream - which you can select between for the concert itself. Not all DVD players can cope with the higher bitrate, but if yours can, use it! There is a clear difference in the sound quality. Especially in the higher bitrate stream, the sound is rich and lush. All five channels get a good workout, with rear channels used sensibly, and the LFE channel makes, in particular, Guy's bass very punchy and precise, driving the music along well. It also makes tracks like One Of These Days and Run Like Hell a stunning assault on the senses! The mix also reveals subtlety of detail that have previously been completely submerged - delicate keyboard parts from messrs Wright and Carin can now be heard, for example. The time that James Guthrie (in particular) has spent working on the sound certainly seems to have paid off. For those who have not seen PULSE, or didn't get to see the 1994 tour, the first half of the show as presented here consists of a selection of tracks going back as far as the aforementioned One Of These Days, and go right up to the then newly-released Division Bell album. The second half is DSOTM, and encores include Comfortably Numb and Wish You Were Here. This review isn't going to analyse the performance of the tracks. Suffice it to say, the band were at the end of a large run of shows, so knew the material well - reflected in the quality of the musicianship. The concert serves as a reminder of how good and how powerful the 1994 tour was. It's also a showcase for what is possibly visually - an impressive testament to the work of Marc Brickman and his team. The recording itself has undergone some re-editing, and all the footage has been tweaked/restored. The result is a crisp, colourful picture, full of detail - so much so that you can even see the hairs on David's arms in certain shots. There's little sign of any digital artifacts, or clumsy edge enhancement. With the exception of various haircuts and styles, this could almost be a present day recording: it is that good. Sure, some of the wide shots, taking in the whole stage, aren't as good as the close-ups, and betray their age, showing the odd bit of colour bleed or lack of sharpness, but you can see how much work has been undertaken to try and make even these shots as good as possible. OK, let's turn to the extras now. Like the concert, these are split over both discs, and each disc's extras are appropriate to the music heard in that half of the show. Disc one's extras start with "Bootlegging The Bootleggers", which brings you audience shot footage of What Do You Want From Me?, On The Turning Away, Poles Apart, and Marooned. These are all taken from different sources, and married up with desk recordings of those songs from the shows in question. Very sadly, Astronomy Domine DOESN'T make it onto the DVD, not even in this section. From the hundreds of emails we've had on the subject, this was one track that people were desperate to see included amongst the extras. Nevertheless, turning back to the songs that ARE included, a nice job has been done in blending the various shots (some wobblier than others!) and it was a good idea to use the desk sound to bring it all together. Next up are the screen films for SOYCD, High Hopes and Learning To Fly. These are synched up to the concert audio, and present the "Mr Screen" footage in its entirety for these tracks. On disc two, you have all the DSOTM screen films (upgraded with plenty of CGI) plus the alternate versions, including an edited version of my favourite, the 'alien' Money film. You also get the promo videos for Learning To Fly and Take It Back. Not sure why these and not others from the era, such as One Slip and On The Turning Away, but there you go. Completing the promos is the one minute TV ad for PULSE - and a very worthy inclusion it is too. The final segment on disc one is a collection of "Tour Stuff". You get maps - which show you where all the shows were (not interactive); you get the list of tour dates in "Itinerary"; and you get "Stage Plans". This is the most interesting part of the section (by far!) - you see a stack of 20 pre-production technical drawings, concept sketches and ideas, including what is called the 'band environment module' which does call to mind the Spinal Tap cocoon! Time to swap discs. Disc two, as mentioned above, gives you the DSOTM films, in all their variations. The alternate Speak To Me is plainly bizarre, and hilarious. Did this ever get shown live? Certainly the 'alien' Money did, even if most people I've spoken to over the years have drawn a blank when I've mentioned it. Sadly, this entertaining homage to B-movies with a serious underlying message, is not shown in its entirety, being cut possibly even before half way through - and is presented here without its original soundtrack, which was a much longer cash register loop, supplemented with sounds of sawing wood, ray guns, and more. Disappointing. On a brighter note, "Say Goodbye To Life As We Know It" is an interesting 15-minute home movie shot by one of the crew. Seriously amateur filming techniques at times, it gives a down-to-earth view behind the scenes, as a member of the crew. Lots of footage of various band members at work and play - including shots of both Polly and David juggling flaming torches! A shame it wasn't longer, and less focused on the crew larking around, but if the footage isn't there, you can't create it some 12 years later. 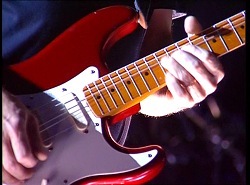 The photo gallery gives you no less than 64 shots taken at various shows; mostly, though, from Earls Court. 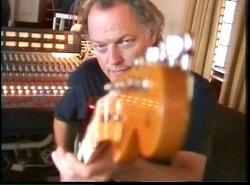 Included is a nice picture of the late Douglas Adams who joined the band one night to provide supplemental guitar duties during one of the songs. The soundtrack for this section is the 1994 ambient pre-show tape - nice to have this included on the DVD, as it was previously only available on the PULSE cassette, and now you get it in surround sound, too. What else is there? Well, you get Billy Corgan's induction speech for the 1996 Hall Of Fame event, along with Billy, David and Richard performing Wish You Were Here. As you can see from the above, the PULSE DVD is absolutely stuffed with material. On the whole, the quality of the concert itself is stunning - visually and aurally - and the extras have something for everyone. Sure, there are things that one would like to see included that didn't make the final version (Astronomy Domine being at the top of many people's lists) but it wouldn't be possible, or practical, to cater for everyone's wishes. From various comments made over the years, the band were keen for this to be seen as one of the best music DVDs ever released. I think they've succeeded admirably. 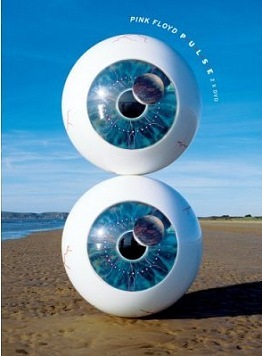 Again, Pink Floyd have raised the bar, and produced a DVD that sets new standards in the realm of music. PULSE can be ordered, with a discount, through the following special links: Amazon UK, Amazon US/International, Canada, France, or Germany. Any item bought through these links at Amazon (not just Floyd items) helps with the running costs of the site, and we really appreciate it.